Many of you are here only because penicillin saved your life, or the life of one of your parents or grandparents. Penicillin’s ability to cure people of many once-fatal bacterial infections has saved so many lives that it is easy to understand why it was once called a “miracle drug”. Antibiotics are chemicals, effective at very low concentrations, created as part of the life process of one organism, which can kill or stop the growth of a disease-causing microbe–a germ. In 1929, Alexander Fleming, a doctor and researcher at St. Mary’s Hospital in London, England, published a paper on a chemical he called “penicillin”, which he had isolated from from a mold, Penicillium notatum. 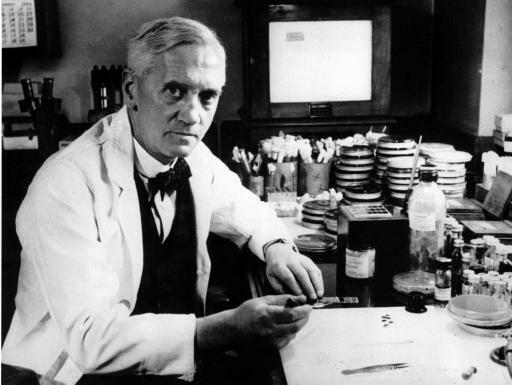 Penicillin, Fleming wrote, had prevented the growth of a neighboring colony of germs in the same petri dish. Dr. Fleming was never able to purify his samples of penicillin, but he became the first person to publish the news of its germ-killing power. Howard Florey, Ernst Chain and Norman Heatley expanded on Fleming’s work in 1938, at Oxford University. They and their staff developed methods for growing, extracting and purifying enough penicillin to prove its value as a drug. World War II (1939-1945) had begun by the time their research was showing results. The main research and production was moved to the United States in 1941, to protect it from the bombs pounding England. Work began on how to grow the mold efficiently to make penicillin in the large quantities that would be needed for thousands of soldiers. As the destruction of the war grew, so did interest in penicillin in laboratories, universities and drug companies on both sides of the Atlantic. The scientists knew they were in a race against death, because an infection was as likely to kill a wounded soldier as his wound. Creating the right environment for growth was the first step in producing enough penicillin to be used as a drug. In Oxford, experiments showed that Penicillium notatum grew best in small shallow containers on a broth of nutrients. Penicillium need lots of air. In the United States, it was discovered that huge “deep fermentation” tanks could be used if sterilized air was pumped continually through the tanks. Production increased even more when corn steep liquor, a thick, sticky by-product of corn processing, was added to the tanks. Corn steep liquor contained concentrated nutrients that increased the yield 12-20 times. Formerly considered a waste material, corn steep liquor became a crucial ingredient in the large-scale production of penicillin. Scientists were also determined to find another strain of Penicillium that might grow better in the huge deep fermentation tanks. Army pilots sent back soil samples from all over the world to be tested for molds. Residents of Peoria, Illinois, were encouraged to bring moldy household objects to the local U.S. Department of Agriculture laboratory, where penicillin research was being conducted. Laboratory staff members also kept an eye out for promising molds while grocery shopping or cleaning out their refrigerators. In 1943, laboratory worker Mary Hunt brought in an ordinary supermarket cantaloupe infected with a mold that had “a pretty, golden look.” This Penicillium species, Penicillium chrysogenum grew so well in a tank that it more than doubled the amount of penicillin produced. The deep fermentation method, the use of corn steep liquor and the discovery of P. chrysogenumby Mary Hunt made the commercial production of penicillin possible. Researchers continued to find higher-yielding Penicillium molds, and also produced higher yielding strains by exposing molds to x-rays or ultraviolet light. Penicillin kills by preventing some bacteria from forming new cell walls. One by one, the bacteria die because they cannot complete the process of division that produces two new “daughter” bacteria from a single “parent” bacterium. The new cell wall that needs to be made to separate the “daughters” is never formed. Some bacteria are able to resist the action of antibiotic drugs, including penicillin. Antibiotic resistance occurs because not all bacteria of the same species are alike, just as people in your own family are not exactly alike. Eventually, the small differences among the bacteria often mean that some will be able to resist the attack of an antibiotic. If the sick person’s own defenses can not kill off these resistant bacteria, they will multiply. This antibiotic-resistant form of a disease can re-infect the patient, or be passed on to another person. Taking antibiotics for viral illnesses like colds can also cause antibiotic resistant bacteria to develop. Antibiotics have no effect on viruses, but it will kill off harmless and even the beneficial bacteria living in the patient’s body. The surviving resistant bacteria, free from competition, will live and multiply and may eventually cause disease. Patients with bacterial infections, who don’t finish their antibiotic prescriptions completely, also allow resistant bacteria to develop. This happens because a small number of semi-resistant bacteria, which needed the full course of antibiotics to kill them, survive. Instead of being a small part of the bacteria causing an infection, the more resistant bacteria take over when sensitive bacteria are killed by the antibiotic. Today, in the United States, deaths by infectious bacterial diseases are only one-twentieth of what they were in 1900, before any antibiotic chemicals had been discovered. The main causes of death today are what are referred to as “the diseases of old age”: heart disease, kidney disease and cancer. We would be shocked to hear of someone dying from an infection that started in a scratch, but, before antibiotics like penicillin, it was common for people to die from such infections. Humans can slow the creation of antibiotic resistant diseases by understanding the uses and limits of antibiotics. Take all of an antibiotic, and only take them when prescribed by a doctor. Research to develop new antibiotics to treat resistant bacteria continues, but research takes time. Time is running out because the world’s biodiversity is decreasing–the source of half of our disease-fighting chemicals.